New York City based bass-baritone Jeremy Hirsch, who “proved a compelling actor and singer” (Los Angeles Times) as the exiled poet in Hanns Eisler’s The Hollywood Songbook, enjoys performing a wide range of opera, art song, and concert repertoire. Hirsch joined the Fire Island Opera Festival’s troupe for the East Coast premiere of Kurt Weill’s first opera Der Protagonist. The following year, he again teamed up with Fire Island Opera Festival, this time in Marfa, Texas, presenting a preview opening concert, a main stage concert: A Musical Tour through the Seven Chakras, and Walk Opera, a musical hike beginning at Mimm’s Ranch culminating in a meditative circle overlooking the West Texas mountains. Arts and Culture: Texas described how Hirsch “stood out among the performers” in the first night’s concert, and was “especially good at interacting with individuals at close quarters while singing”. Some of Hirsch’s most valuable experiences as an artist involve new opera. In 2016, Hirsch had the privilege of creating the title role in Felix Jarrar’s opera adaptation of the Edgar Allen Poe short story The Fall of the House of Usher. He created the leading role of Harlan Hubbard in Bard Vocal Arts Program’s world premiere of Shawn Jaeger’s opera Payne Hollow. And during the 2012⁄13 season, he created the role of Dr. George Burkley in the world-premiere of Joshua Bornfield’s Camelot Requiem commissioned by the Baltimore-based troupe The Figaro Project to commemorate the 50th anniversary of John F. Kennedy’s assassination. He will create leading and supporting roles in two new one-act operas this year in a co-production between American Opera Projects and New York University. Hirsch’s standard repertoire includes Mozart’s Figaro and Leporello, Britten’s Bottom, and Donizetti’s Dr. Dulcamara which he will cover this summer as a fellow at Music Academy of the West. Hirsch regularly performs recitals across the country and in Canada. He was just a featured recitalist at Arizona State University, singing on an all Beethoven program. He was one of two Colburn Fellows at Songfest in downtown Los Angeles, performing a joint recital as well as participating in various concerts and masterclasses. The following year, Hirsch returned to Songfest starring in Edwin Cahill’s production of The Hollywood Songbook. There he also performed tunes from the Great American Songbook with John Musto at the piano, and was a soloist in concerts curated by Martin Katz, John Harbison and Thomas Hampson. He has been a guest artist at Northwestern University, performing excerpts from Shawn Jaeger’s Payne Hollow, and was seen in recital at the historic Vanderbilt Mansion in Hyde Park, New York in a concert highlighting cultural diversity in American song. In 2013, he joined the Washington D.C. Embassy Series, performing a program of songs and arias at the Romanian Embassy. Recently, he was an Art Song Fellow at the Toronto Summer Music Festival. 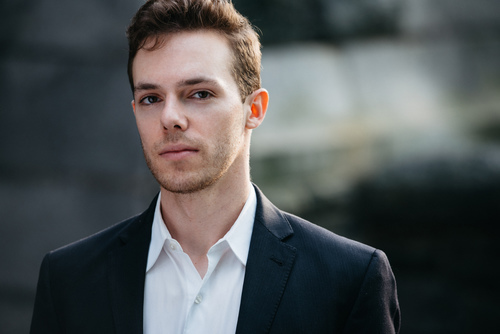 On the concert stage this season, Hirsch has performed as the bass soloist in a number of standard repertoire oratorios as an Encore Young Artist for Ars Musica (New Jersey). Pieces with the group include Handel’s Messiah, Mendelssohn’s Die erste Walpurgisnacht, Rossini’s Petite messe solennelle, Mozart’s Coronation Mass, and Haydn’s Lord Nelson Mass. Also in the current season, he was the bass soloist in Beethoven’s 9th Symphony with the Ridgewood Symphony. Other concert performances include Adam in Haydn’s The Creation, with the American Symphony Orchestra led by maestro Leon Botstein, Haman in Handel’s Esther, and a program of Handel and Bach with the Albany Symphony streamed live from Troy Music Hall on Classical WHMT-FM. Joining the Albany Symphony again this season, Hirsch co-starred in the outreach production “Finding Do-Re-Mi”, as Nemo-rino. With the help of a clown-fish costume and his best friend Dori, he taught kids about opera using canonical recitatives, arias, and duets. Hirsch is a graduate of soprano Dawn Upshaw’s Bard Vocal Arts Program and graduated from the Peabody Conservatory with a Bachelor of Music in voice studying with William Sharp and a minor in English from Johns Hopkins University. He currently studies with Sanford Sylvan and Andrea DelGiudice. When not singing, Hirsch enjoys reading, listening to podcasts, and watching live comedy. He also writes opera reviews for the online theater publication The Entertainment Hour.